Pay Per Click (PPC) Management is an effective way to get instant and targeted traffic to your website. To be effective, your campaign needs the assistance of Devenia’s specialists, as we have extensive experience running PPC campaigns. We also provide consulting services for PPC and SEO campaigns. In PPC, you pay an organization (usually Google, Yahoo, or Bing) at a flat or bid rate to host your advertising on participating company’s websites. Devenia’s role is to help your business choose the right keywords and create ads that sell. For example, if you are a kid’s toys merchant, we know the keywords “kids toys” are incredibly competitive and can suggest an appropriate SEO strategy. While “kids toys” is a great, but competitive keyword to focus on, our SEO tools will also factor in related, but less competitive keywords such as “puzzles for kids,” “kid toy,” and “toddlers toys.” Once we have created ads based on the best keywords, we will help you write effective landing pages (pages where customers first enter), which will in turn increase your sales and service requests. We are willing to accommodate any budget size and require no minimum or maximum. If many users choose to click on your ads, costs can escalate rapidly. If you desire predictability and would like to put a maximum on your PPC budget, we are happy to work with that. Or, maybe your business has extra funds available for testing purposes and you’d like to begin experimenting. Whatever your need, Devenia is willing to help you. How does a PPC campaign work? Sometimes, it can be helpful to observe an example in order to gain understanding. · Suppose you are one of our clients and you ask us to bid on the third position on the first page of a search engine. · We first ask you to provide us with your budget limits and whether you are bidding on a per-click or specific position basis. Remember that you only pay for results. · We proceed by bidding the minimum possible while maintaining your requested search engine ranking. · We ensure that visitors click on your ads while searching for a keyword related to your products or services. · Remember also that in order to be in a particular position on the first page of the search engine rankings, you should constantly bid to remain in that position. Bids are constantly changing, and the competition can take your position away at any given moment. · From this example, it is clear that the world of Pay Per Click management is complex and fast-paced. At Devenia, our experienced PPC experts can handle this process for you so you have time to focus on more important tasks. · PPC can result in a large amount of targeted traffic in a short amount of time. · Advertising via PPC results is a much lower cost per bid than other forms of advertising such as television, newspapers, and magazines. · You have total control over the budget size. If you want to pay 5 cents per click, then that’s what you pay. If you want to pay $1 per click, you can pay that also. You can also define a budget maximum. If you have reached your budget maximum of $1,000, for example, your ads on other websites will simply stop displaying and no further charges will be incurred. Why Hire Devenia as your PPC Campaign Manager? 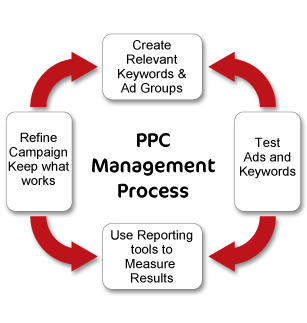 · PPC management takes significant time due to the required keyword research. Choosing the best keywords for your site can be very difficult, and hiring a professional is more productive and effective. · Devenia’s advertising professionals know specific methodologies for finding the most effective keywords for your ad campaign. · Devenia’s PPC professionals understand all nuances of creating successful PPC campaigns, and may use “broad matching” to have your ad displayed with similar, but not exactly the same, keywords. · With literally thousands of variations, keywords are difficult to research and require the services of an experienced professional. · Our PPC professionals will make the time to test variations and monitor results to help you create the most successful PPC campaign possible.